Aqualogic™ Flow-Through Treatment Systems are custom designed, automatic treatment systems designed to treat industrial wastewater. at flows of 25-400 gallons per minute. The equipment will treat mixed rinsewaters for precipitation of heavy metals, removal of oils and grease, and solid dewatering, producing an effluent suitable for discharge to local sewers, according to permit regulations. Chrome reduction reactors are supplied with covers and a vent which may be attached to the exhaust system to vent any fumes. 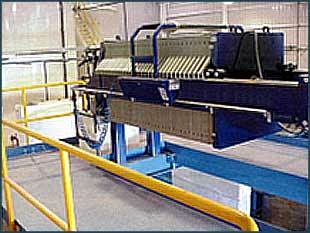 The cyanide oxidation reactors are two stage with extended reaction time to assure complete destruction. The unique Aqualogic settling tank results in lower suspended solids in the final effluent than the typical inclined plate or lamella type clarifier. The inverted T shape sludge pick-up also thickens the sludge blanket as it slowly traverses the settling tank. The sludge hold tank is covered with a grate to serve as an access platform for the settling tank. The central control panel houses pH instrumentation and a PLC programmed to control all process steps. An operator interface is mounted on the door for process inputs. 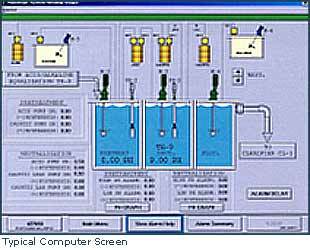 Optional computer control provides process control with monitoring and alarm screens. All process settings are inputted through the computer. Process controls such as pH, ORP, and flow are logged and may be printed for submission to local authorities. A treatment system requires much more than just the treatment modules to operate efficiently. 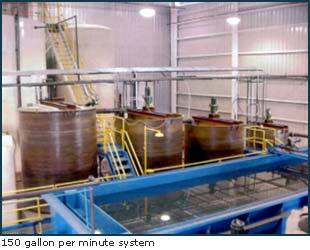 Equalization of effluent prior to the first treatment tank is required to even out variations in flow and concentration. Tanks to hold strong dumps are an important detail with any system. The client has the option bleed these at a flow proportioned rate into the proper treatment cycle or accumulate for haul off. 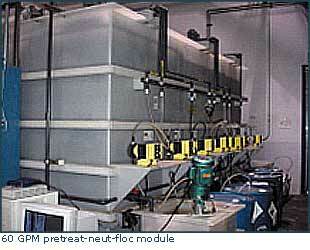 Aqualogic Inc. has been engineering, building, and installing industrial wastewater treatment systems since 1966. Many of our clients have discharge limits significantly more stringent than Federal limits and are meeting these low limits directly from the clarifier. We believe that every clients effluent is unique and requires special attention. Treatability studies are performed on each effluent in our State certified laboratory to optimize the treatment procedures and to provide services to our clients on an ongoing basis.